Upon invitation by the College of Architecture, Hui Jun Wang and Christian Junge present the results of Urbanlogic’s Foshan Zhangcha urban development support project, which had been completed in December 2012. Upon invitation by the German Chamber of Commerce in Beijing and Far Eastern Consulting, Urbanlogic were invited to present their research on the drivers of China’s urban development to a delegation of the German Sustainable Building Council (DGNB). 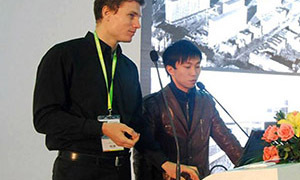 On March 28th and 29th 2012 the fourth session of China’s Real Estate Science Development Forum- sponsored by China’s Real Estate Research Institute and China Real Estate Association- was held in Shanghai. More than a thousand representatives from various government departments and social organizations participated. Christian Junge was invited to speak at one of the sub-forums on the issue of social housing planning and design. Christian Junge was invited by Prof. Robin Lewis to give a public lecture on the topic of social policy in urban planning and on eco city developments in China.